Former Ultimate Fighting Championship (UFC) Featherweight title contender, Chan Sung Jung, will return opposite high-flying kickboxer, Yair Rodriguez, this Saturday (Nov. 10, 2018) at UFC Fight Night 139 inside Pepsi Center in Denver, Colorado. In the last six years, Jung’s performances inside the Octagon have been nothing short of spectacular. One punch knockouts, insane brawls and a freaking twister fill up his recent resume, but sadly Jung’s career has been hampered by layoffs. 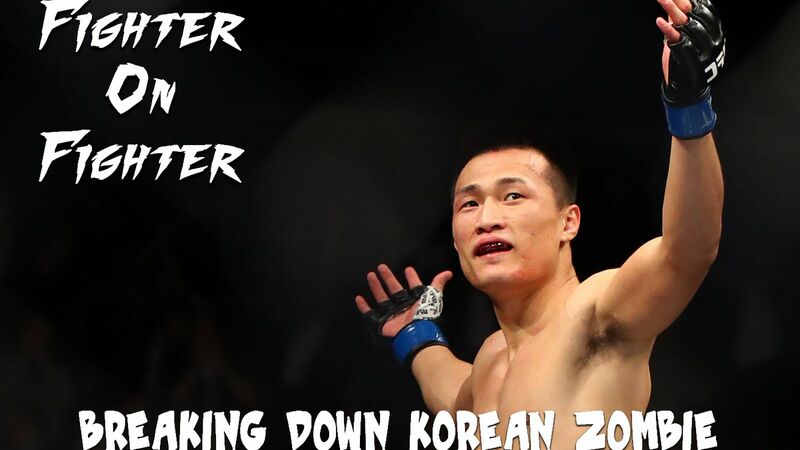 One absolutely cannot be blamed on the South Korean: His mandatory two years of military service kept him sidelined after his title loss to Jose Aldo. Jung returned from that layoff in spectacular fashion opposite Dennis Bermudez, but even that fight took place in Feb. 2017. It’s been a long while since we’ve last seen “The Korean Zombie,” but hopefully he’ll manage to avoid any ring rust a second time. A third-degree black belt in Hapkido and second-degree black belt in Taekwondo, Jung does not play the part of outside striker looking to kick. Instead, he prefers to exchange from within the pocket, where he is quite dangerous both while leading and countering. Because of his low hand position, Jung’s primary form of defense is head movement. He will occasionally play the outside and use distance as a safeguard, but Jung’s love of fighting in the pocket often overrules that strategy. Feeding further into the odd style of Jung is his habit of pushing a pace that he cannot maintain, as Jung’s wild offense requires time to recover from. During those periods where Jung is catching his breath, his head movement suffers most of all, and Jung is far more hittable. While fresh, however, Jung does a very nice job of punching while getting his head off the center line. Both on offense and defense, the dipping jab is a favorite technique of his. When pushing forward, Jung will use this spearing jab to bait his opponent into ducking into an uppercut or leaning back into overhand. The dipping jab works quite well on an advancing foe as well. Against Dustin Poirier, for example, Jung repeatedly gave ground as “The Diamond” pushed forward, but Poirier kept his head perfectly still and stood fairly tall. Jung’s slip inside may not be a guarantee that his foe’s punches will miss, but it gives him a decent chance, whereas his hard jab finds its mark far more often than not. Interestingly, Jung’s scrap with Dennis Bermudez saw a pair of devoted dipping jabbers clash, making it a battle of Jung’s reach vs. Bermudez’s lower angle of attack. The way Jung applies his right hand is another interesting technique. He is deceptively quick with the strike, which allows Jung to enter the pocket before his opponent expects. Once there, Jung will follow up with a rolling left hook or a slick clinch takedown. Additionally, Jung makes great use of both the cross counter and pull and return cross (GIF). Both are classic uses for a sharp right hand and strong timing, skills which Jung has sharpened by spending so much time working in the pocket. The final pocket boxing tricks of Jung revolve around the uppercut. On the counter, Jung does a nice job of slipping inside the jab and returning the right uppercut. Though that technique is more commonly seen in boxing, it works well for Jung opposite fighters who lean over their lead leg. In truth, Jung’s uppercut knockout of Dennis Bermudez should’ve been somewhat easy to see coming. Bermudez has been stunned many times while leaning over his lead leg, as he does a nice job dipping his head during the jab but keeps it there for too long. Jung set up the uppercut well, dipping and loading the cross two or three times. Once he noticed Bermudez was ducking beneath the right hand, Jung switched to a right uppercut and found his mark (GIF). This approach is a quality double-threat from the South Korean, one he’s used prior to the Bermudez fight as well (GIF). Aside from his skill in the pocket, Jung has shown some strong kicking technique in the past, even if he rarely relies upon it. This was most notably in his bout with Poirier, as his foe’s Southpaw stance opened lots of opportunities. He scored with hard roundhouse kicks to the body — often underneath Poirier’s cross — as well as stepping knees and the occasional snap kick. Finally, the flying knee is a major part of Jung’s attack. Whenever his opponent covers and backs straight up, whether due to being hurt by a punch or by Jung’s pressure on its own, Jung will advance with a flying knee straight up the center. Even when blocked, it’s practically a guarantee that some part of the impact will get through, allowing Jung to follow up with more punches on a shell-shocked foe. A Judo black belt, Jung has proven to be quite crafty at landing his takedowns inside the Octagon. It’s not an aspect of his game that he turns too often, but Jung’s ability to dictate where the fight takes place has been successful against just about everyone aside from Jose Aldo. From the clinch, Jung’s timing is excellent. He attempted a pair of takedowns from that position opposite Poirier in very different circumstances, and both were well-executed. In one, Jung caught Poirier backing straight up with fairly flat feet, making it easy for him to transition directly from the cross into a body lock slam. The second takedown was a more interesting one, a reactive trip based on Poirier’s leg position. In this week’s technique analysis, we talk about why keeping hip pressure in the clinch is important, but also how it can be costly if the upper body positioning isn’t there. Lastly, Jung scored a slick foot sweep in his second match with Leonard Garcia. Attempting a half-hearted single leg, Jung quickly transitioned to a single collar tie. Controlling Garcia’s posture with one hand, he tripped Garcia’s foot while yanking him to the side, effectively dropping him to the mat. Once Jung gets on top of his opponent, his ground and pound is very good, thanks to his solid posture and ability to stack his foe’s hips. After tying up a hand, Jung will collapse his arm into an elbow. Another great trick he used against Poirier was to reach back like he was going for a guard pass then come down with a big punch. A Brazilian jiu-jitsu brown belt with nine wins via tapout, Jung is a very opportunistic and aggressive submission fighter. Similar to how he is a willing counter puncher and bruiser, Jung is equally dangerous from his back and on top. From the guard, Jung is incredibly active, stabbing at his opponent with elbows while constantly looking to jam one of his opponent’s arms between his legs to set up a triangle. Once the head and arm are trapped, Jung will quickly transition into the arm bar and back to the triangle as necessary, always looking to finish one of the holds. Additionally, Jung showed off the power of butterfly hooks as a defensive tool. After rocking Poirier, Jung’s foe managed to get in deep on a double leg, driving forward before Jung could effectively sprawl. Rather than concede position, Jung went with his opponent’s momentum, using the butterfly hooks to roll Poirier into mount. The most famous finish of Jung’s career came via twister, the only one in UFC history and a pretty perfect display of how the submission works. The twister is a back or spinal crank, one that locks an opponent’s spine into place before twisting the head/neck in unpleasant fashion. First, Jung secured his opponent in place with single leg back control, locking down that one leg with his own. Once that single-leg control is in place, Jung reaches around Garcia’s head and traps Garcia’s arm behind his back, allowing him to apply pressure to the crank. Jung’s D’arce choke finish was also pretty slick. After crushing a wounded Poirier under a heavy sprawl, Jung quickly slid his outside arm around Poirier’s head and arm. Locking in the rear-naked choke grip, Jung applied a twisting pressure to force Poirier to his back. From that position, Jung was able to drop his weight on Poirier’s neck while squeezing, putting “The Diamond” to sleep quickly (GIF). Jung is a violent and opportunistic fighter, one of the most entertaining men to watch on the roster. At 31 years of age, it definitely isn’t too late for “The Korean Zombie” to return to the title mix — fight fans would definitely get behind him. As such, this is a very important moment for Jung, a chance to return from injury (again) and get the ball rolling toward the top. Andrew Richardson, a Brazilian jiu-jitsu brown belt, is a professional fighter who trains at Team Alpha Male in Sacramento, California. In addition to learning alongside world-class talent, Andrew has scouted opponents and developed winning strategies for several of the sport’s most elite fighters.